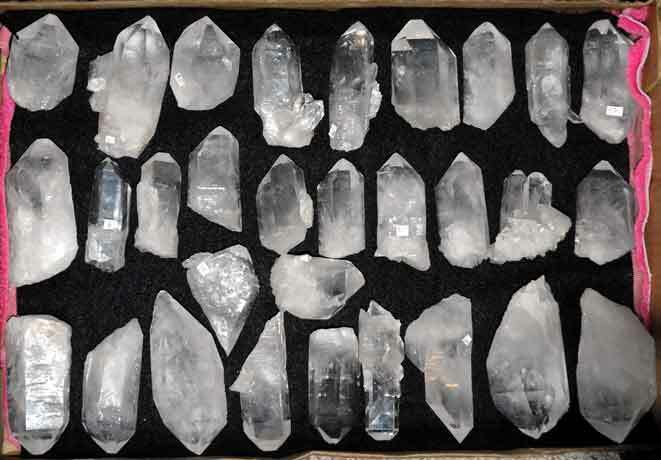 Large and small clusters available, including super quality crystals from the McEarl Mine. 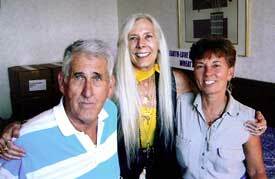 Crystal miner Lee with friends, Sherry Small and Melody, author of “Love Is In The Earth: A Kaleidoscope of Crystals” (THE reference book describing the metaphysical properties of minerals). Clusters can be held in the hand during meditation or placed on the body. 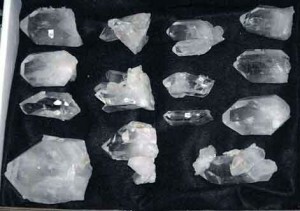 This fairy-like crystal with iridescent rainbow flashes, is the result of a special process in which the surface of clear natural quartz is bonded with vaporized, finely powdered pure gold. This color-enhanced crystal stimulates the throat chakra, enhancing communication of inner truth, expression of inner emotions in a positive way, while safeguarding from psychological attacks. 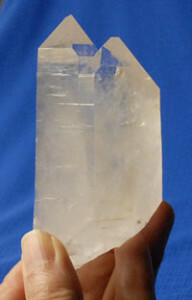 Clear quartz is the universal stone. 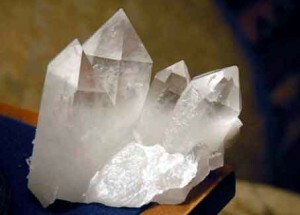 A pure & powerful energy source, it receives, activates, stores, transmits, and amplifies energy. Program it with your mind; use a hand size crystal to clean your hands before doing energy work and for healing; Stimulate brain functions and activate all levels of consciousness. Also called the Bridge or Inner Child crystal, the Penetrator features a main crystal that has a smaller crystal lodged partially within it. These are beneficial for working with childhood or spiritual issues that are blocking your personal growth. 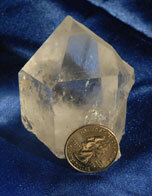 Said to be the ultimate spiritual teacher’s crystal. Priced according to size and quality. 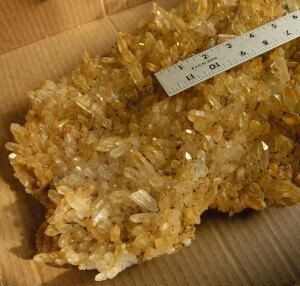 This fairy-like orange crystal with iridescent rainbow flashes, is the result of a special process in which the surface of clear natural quartz is bonded with vaporized, finely powdered gold and copper. Color is permanent and can’t be rubbed off. Used to boost self confidence. Use it to help recognize your unique gifts, talents & creative abilities. 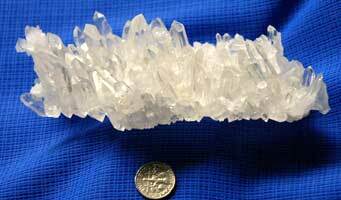 A joyful crystal that promotes drive & enthusiasm. It will direct energy to where it is most beneficial to stimulate, heal, and motivate! 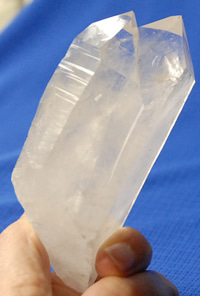 Quartz crystals work as conductors, allowing you to focus energy via your thoughts to stimulate healing. Use your imagination! 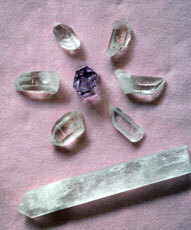 Crystal energy can help you access a higher level of consciousness and turn a desire into reality. Used for centering, grounding, meditation, protection, removing (clearing) negativity, releasing anger, and balancing energies of mind and body. 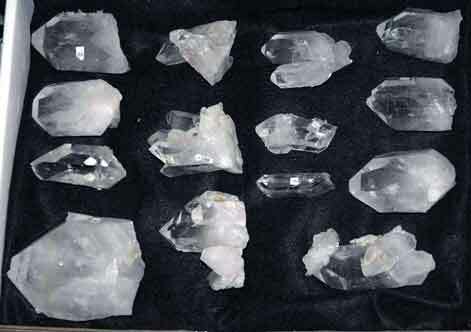 Enhances dream awareness and channeling abilities. Mitigates depression, is mildly sedative and relaxing. These Natural, Mt. Ida, Arkansas crystal points and clusters are hard to find. 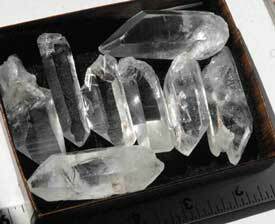 Phantoms within a crystal are an indication of the experiences and transformations the crystal has undergone in its evolution. Black manganese (chlorite) in these small points & clusters, provide shielding and protection while the super clear quartz amplifies the energies. Uses: psychic development, meditation, clearing, tranquility. Represents phases one has experienced in all lifetime, unites people with the same destiny. Crown Chakra. Place a smoky cluster in a room to help clear negative energy, reduce depression and create calmness. 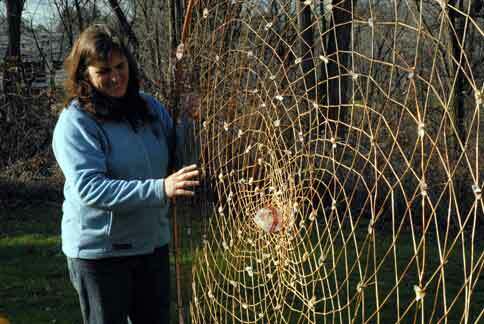 Good for our “root” chakra (the one at the base of our spine)- the kidneys, adrenal glands, bones, colon, spine and legs. Rare healing stone found only in Arkansas. Assists one in seeing the whole picture prior to making a decision. Helps one manage difficult situations and provides information so one can recognize direct and indirect methods of accomplishing a task. 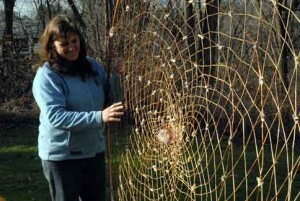 Increases intuition and activates inner knowledge. 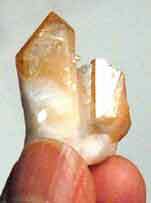 Crystals can store information and they can also be programmed. 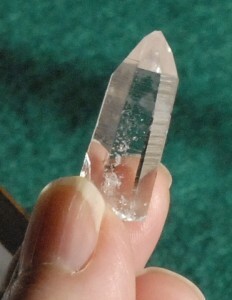 You can put specific information into a crystal and then “program” the crystal to do a specific thing. For example, you can program a crystal to neutralize electromagnetic fields (EMFs) and thus protect you from harmful radiation.